Today, December 30, 2016 on the eve of the start of the new 2017 – the year of the fire rooster, which, based on belief in Chinese horoscope represents continuous movement forward and pursuit to the new things, we are pleased to announce that we have created another three bodies of self-organization of Roma communities in Transcarpathian region. The three new bodies of Roma self-organization bodies were established in Roma settlements in the villages of Velyki Lucky , Pavshyno a> and and Chomonin . It took three years of hard work to create the first Roma self-organization body in Ukraine, however, for the three newly created bodies, it took only three months to establish them, It is an incredible experience and success. The new institutions will include representatives of the Roma minority that will be able to delegate their representatives to the local authorities, that will bring Roma communication with local authorities to a qualitatively new level, will give the ability to represent and protect the interests of their Roma communities. In the following year, in order to empower Roma communities in Mukachevo district in their decision-making processes at the local level and to ensure the sustainability of established institutions, we will establish a network between representatives of local authorities and members of the Roma self-government, which will allow us to establish an effective interaction between Roma communities and local authorities , which will set up a permanent dialogue between the decision-making sides in the areas of a vision development of Roma communities with the participation of all sides in this process. Now to support the process of cooperation, joint decision-making and daily support for Roma communities, Human Rights Fund “Progress” has trained and prepared 2 assistants, each for one Roma community (one from the Roma community among with the initiative group and one from the Resource Center of the Roma self-government development), which will be a key link between the members of the body of self-organization of the Roma community and village councils. 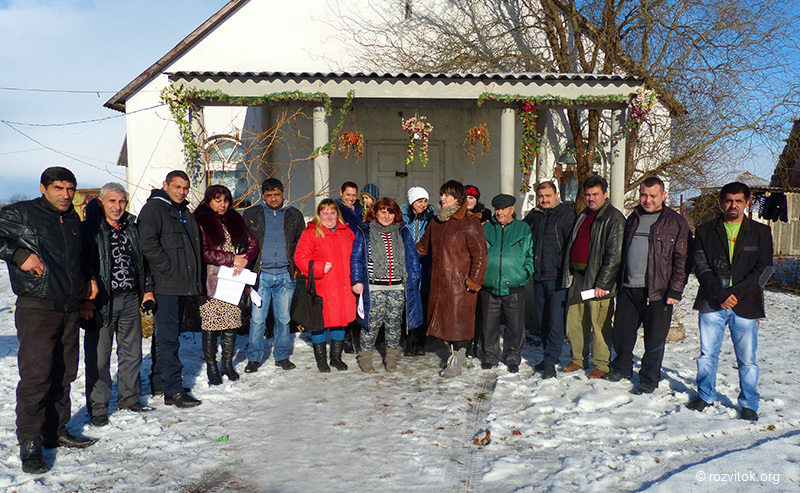 The next practical step towards the development of the Roma self-government in Transcarpathian region will be a common development of annual work plans with the chairmen of village councils, in which there have been established bodies of Roma self-organization, and, additionally, the Regulation “On the mechanism of granting self-organizing bodies of Roma communities with separate powers of the village council, disposal of property and money to them ” will be approved. Members of the organs of self-organization bodies of Roma communities will be included in the coordination councils, commissions and committees at village councils and will actively participate in the discussion of the draft decisions and the development of rural development programs on areas where the Roma settlements are located. We would also like to note that during the creation of self-organization bodies, we have paid special attention to the involvement of Roma women to participate in initiative groups and their direct inclusion to the Steering committee. Now we have at least two Roma women in each organ of self-organization, who serve as deputy chairmen and secretaries. It should be reminded also that the bodies of self-organization of the Roma community are an important part of the local government system. They allow the representatives of the Roma national minority to participate in solving their local issues and to use the powers delegated to them by the local council. In this sense, they are also to some extent the authorities, because they have features in common with local authorities and other public authorities. A significant advantage of Roma self-organization bodies comparing to the local authorities is that the exact residents of Roma settlements are included in it. The thing is, that people with knowledge of the problems from the inside, with an understanding of what changes are required in settlements are attracted. We believe that only the active and motivated community members that know how to use the opportunities provided by the state will be able to effectively solve the problems of their society. It will become a role-model and a success story for other Roma communities in Transcarpathia which want to have the alternative way of development of their society.